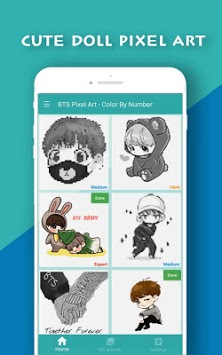 Doll Pixel Art -Color by Number, a totally new coloring book for adults,kids and special for K-POP fans, allows you to paint hundreds of beautiful,fun and cute pixel art by numbers about K-POP star. 200+ beautiful artworks, 5+ HD challenging pictures provided to you to color by number, all free! This pixel coloring books is an anti-stress sandbox games, It's bringing great collection of HD sounds that can be mixed into the perfect relaxing ambiences to play when you are drawing. A pixel art therapy helps you relieve stress and anxiety from work and life. Whenever you want to meditate, relax and develop your concentration, just open this app and start drawing. 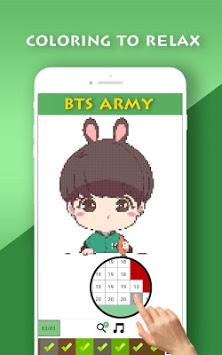 Coloring beautiful images of K-POP stars for any age and family and feel such enjoyable, stress-free moments and be creative. Release your inner artist and share your sandbox pixel art with your family and friends. - Simple but addictive coloring game. - Best coloring games for any age and family. - Search tool to find pixel to coloring. - No wifi need and no time limit, coloring by your pace. - We designed all the paintings carefully, it will give you an excellent way to feel calm and enjoy hours of fun and relaxation. 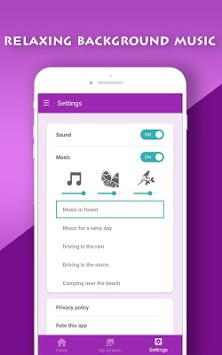 - Relaxing sounds when playing with ocean sound, rain sound, thunder and forest sounds. - Helps to develop children’s concentration and recognition of numbers and colors. - Use 1 finger to Press and hold to coloring continuously which makes sandbox coloring faster. - Your artwork’s progress will be auto-saved when you leave or close it.